To show you an example of Print Report functionality lets walk through creating a simple quarterly revenue report that we want to burst out for each business unit. Once you have your source report laid out in Perspectives you can use Print Report to define the subset(s) which you want to use to create individual reports from. 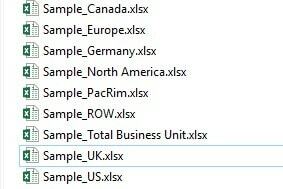 In this example we will just choose a subset for the plan_business_unit dimension and we will expect to receive a version of this report for each business unit in that subset. Alternatively, we could choose to receive a single report with many tabs representing each business unit by selecting the “Print Single Workbook” option. The last step in Print Report is to choose how you want the reports to be output. Your choices are to print the results, output them to Excel files, or output them to PDF files. 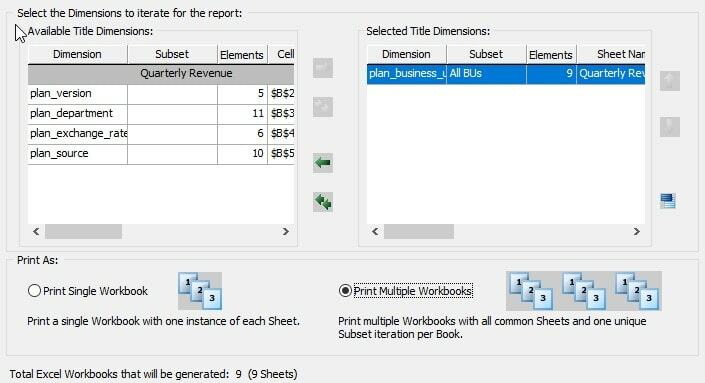 You also can choose to generate titles for each of the workbooks you output and whether you intended to include the TM1 formulas in the report. After running the Print Report definition, we setup we can see it created all 9 sheets we expected. Print Report may not be available but QueBIT has you covered! ReportWORQ allows you to focus on your more pressing business problems and it takes care of the your daily reporting and distribution needs. ReportWORQ isn’t a reporting utility but rather a reporting platform that gives you transparency in to your reporting process while providing an intuitive strategy for managing it. Try ReportWORQ free today and see how it can help you take reporting to the next level! You can find more details on ReportWORQ here!